Pedestrians walk along Wall Street while looking at their smartphone devices in front of the New York Stock Exchange in New York. 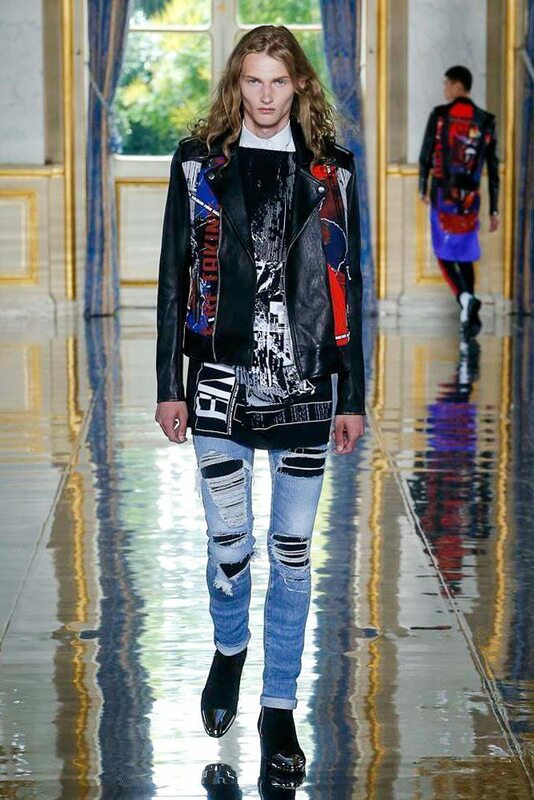 Michael Jackson might have died a rather tragic death nine years ago; but his memory was alive and kicking amid the gilded glory of the French Foreign Ministry Sunday lunchtime in a Balmain runway show in Paris. The King of Pop appeared in glittering sequined jackets; extended T-Shirts marked “Balmain On Tour,” black and white cricket blazers and multi-zip red leather biker jackets. Many of the cast wore white socks, of course; and bien sûr a silver glove. Instead of the red hand-written Bad insignia of Michael, this was rewritten as Balmain. This year celebrates the 70th anniversary of the house, founded by Pierre Balmain in 1946, as France emerged from WW2. So Balmain’s Creative Director Olivier Rousteing proposed sweatshirts and American quarter back tops featuring 1946 in sequins. The Gloved One’s weakness for military regalia was seen in multi-button beaded mess jackets; and naval cadet jackets worn over hooded dressing gowns. This was also a co-ed show, and the female cast had lots of the big hair of the kind that Jackson’s lady dance partners preferred in his famous videos. The entire soundtrack was a remix of classic Jackson songs: They Don’t Really Care About Us, Bad, Scream and a great immortal mash-up version of Jam. The house managed to wangle a pretty incredible location: inside the Foreign Ministry, or as it is known the Quai d’Orsay. Security was, understandably, very tough, with all guests required to show IDs. Quite what they made of the madly dressed fashionistas was apparent from the rolling eyes of the CRS paramilitary police guarding the building. The show climaxed with a powerful series of jackets and studded morning dress ideas, reminders that Rousteing is an extremely gifted tailor. However, where five years ago Rousteing was a leader in the design pack, with his hyper glam chic, this show felt rather predictable. Not a strong artistic statement; but a mere merchandising moment.